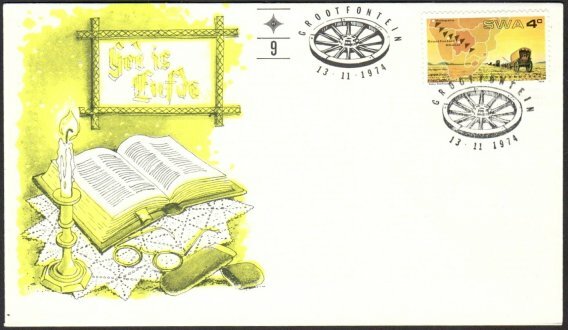 From 7 July 1888 the mail came under German Postal Administration. 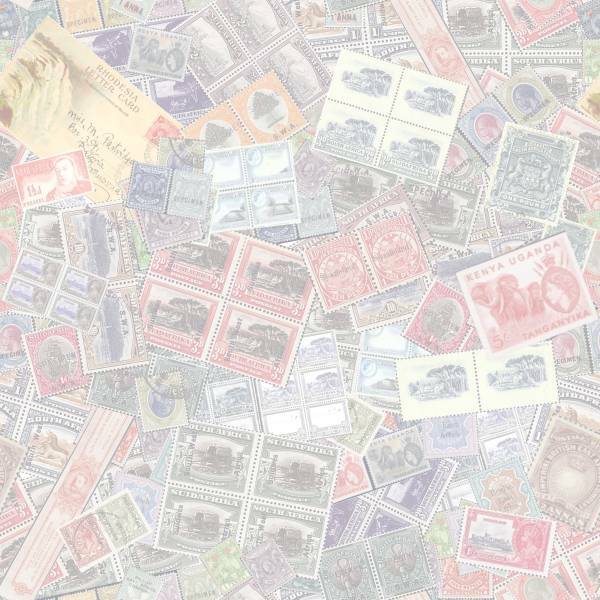 At first German stamps saw use, followed in 1897 by the German 'Eagle' issue being overprinted Deutsch-Südwestafrika. 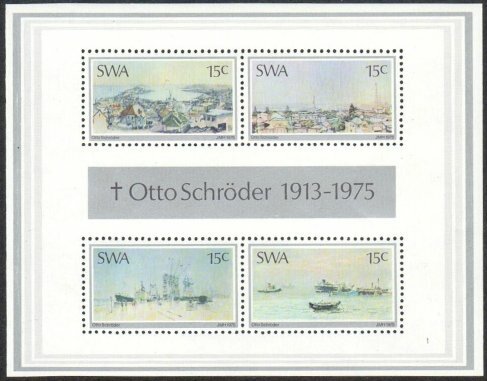 In January 1901 the German Colonial 'Yacht' issue was introduced, first without watermark and in 1906 on watermarked 'Lozenges' paper. 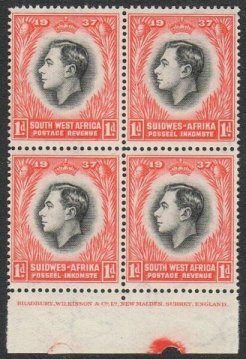 In South Africa General Botha announced on 11 August 1914 that he was acceding to Britain’s request that he organize four volunteer units in anticipation of an invasion of GSWA. 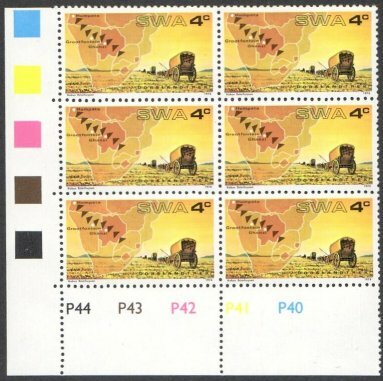 The movement of German Forces to secure their water holes at Nakob, north of the Orange River, was relayed to the Union’s press as a German invasion of the Union. 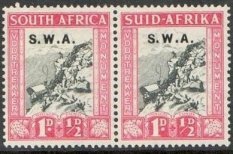 After a motivational speech by General Smuts, on 8 September, the House of Assembly approved the Union’s declaration of war on Germany. 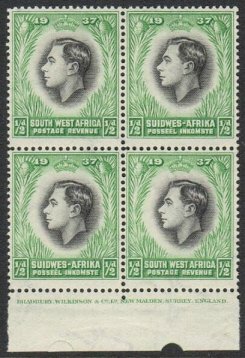 He and Botha prepared to oversee the invasion of German South West Africa. 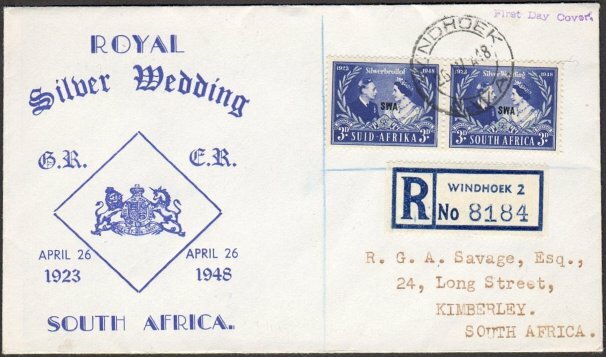 When war commenced, the line of rail from De Aar had reached Prieska and an extension to Upington was a priority. 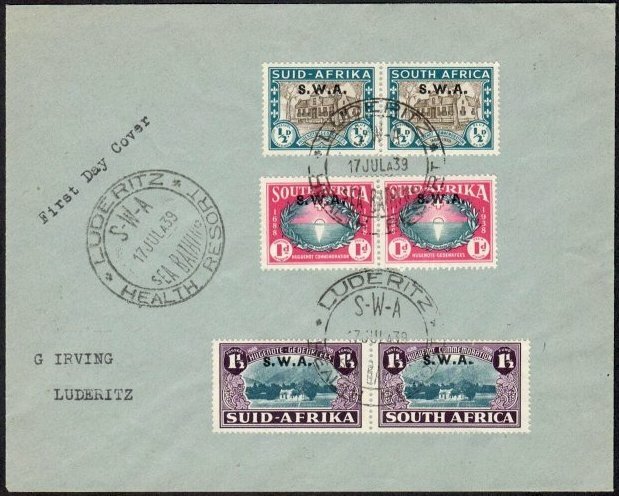 Work commenced on 31 August and at a rate of from 2¼ to 3¼ miles of track per day it reached Upington on 20 November 1914. The next stage was to cross the Orange and Molopo rivers which slowed progress. Finally on 25 June 1915 the Union and GSWA Railway systems were linked together at Kalkfontein. After the surrender of the Germans on 9 July 1915 the administration of the country was taken over by the Union of South Africa who established a military régime. 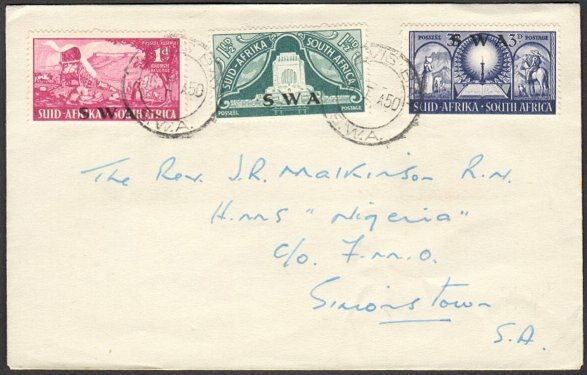 On 12 September 1919 the Union House of Assembly formally accepted a mandate from the League of Nations to administer the country as a Protectorate and it became an integral portion of the Union. During a visit from Lord Buxton during October 1919 he stated...In no circumstances will the country be handed back to Germany. 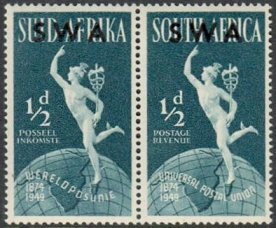 On 17 December 1920 the League of Nations Mandate took effect and by the end of the year all troops had been withdrawn and travel permits and censorship was abolished. 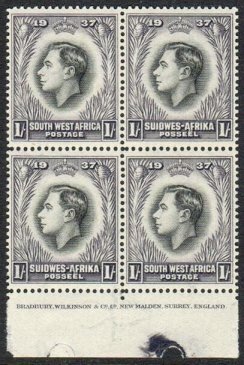 On 1 January 1921 Civil Administration of South West Africa commenced. 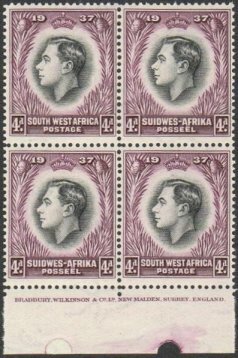 Between July 1915 and January 1923 South African stamps were used in South West Africa. 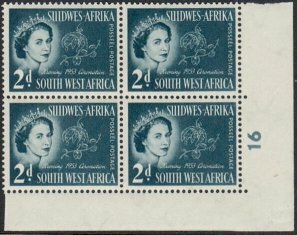 This was followed by overprinting the SA King's head definitive for use in SWA. 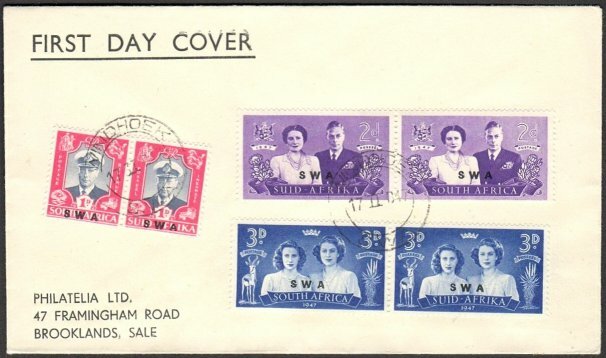 Up to 1952 virtually all the country's stamp issues consisted of overprinted South African Stamps. 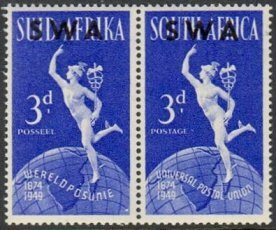 In March 1931 SWA finally issued its own set of Pictorial Definitives from ½d to 20/-. 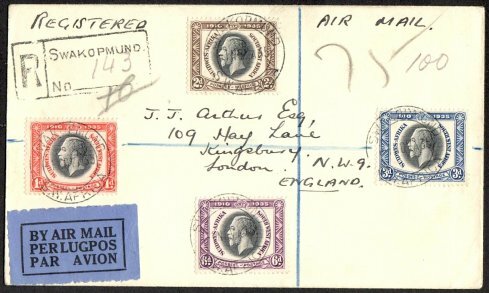 Twelve values plus two Airmail stamps being 3d and 10d. 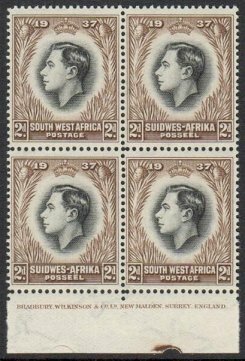 In keeping with the rest of the Crown Colonies and Dominions, SWA participated in the first Commonwealth Omnibus series celebrating the 1935 Silver Jubilee of King George V. Furthermore it was their own exclusive design and not simply another South African overprinted set. 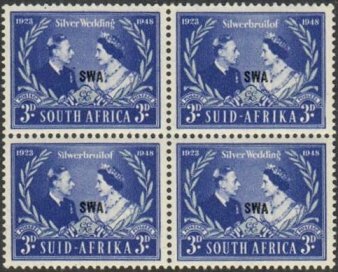 1935 - 38, three Voortrekker sets, 1939 Huguenots Landing Anniversary, 1945 Victory, 1947 Royal Visit, 1948 KGVI Silver Wedding, 1949 UPU and Voortrekker Monument. 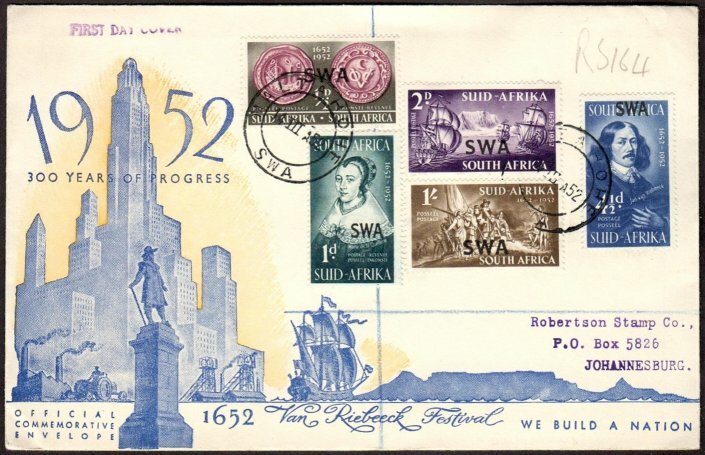 Finally the 1952 Landing of Van Riebeeck. 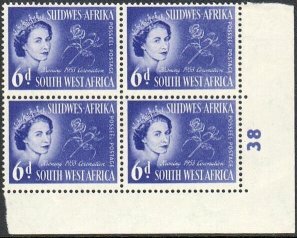 Started with the 1953 Coronation and continued up to and including the 1990 Flowers - A total of seventy six issues. 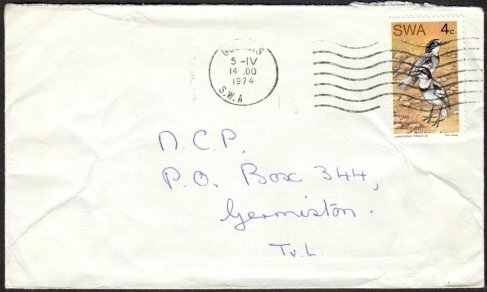 Having heard that the remainder of at least one of the values of the Jubilee stamps was being used up fiscally on cigarette packets, we made enquiry of the Director of Post and Telegraphs if this statement was correct and at the same time asked if official information could be supplied as to the number of stamps printed and used. Situated near Mariental and has a surface area of 25 square kilometers. 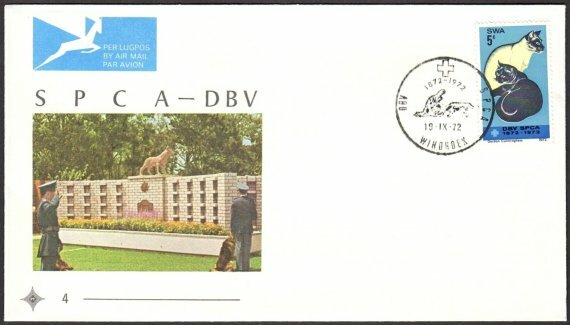 The first two Official FDC envelopes were identical to those used for the corresponding RSA commemoratives e.g. 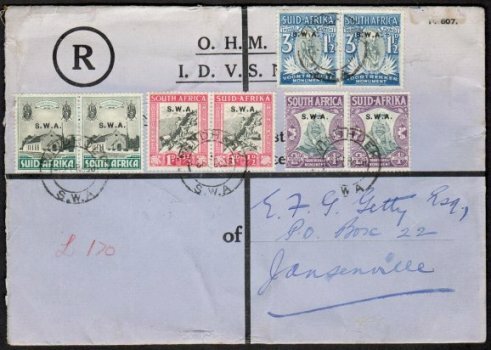 This issue commemorates a series of Treks from the Transvaal through the waterless Kalahari between 1874 and 1905. 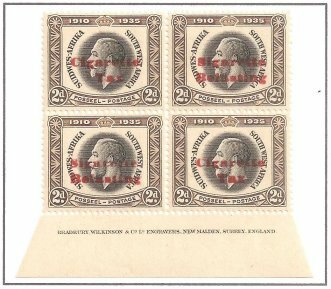 The last group left the Transvaal after the end of the Boer War in an attempt to escape the misery and poverty that was a result of that conflict. 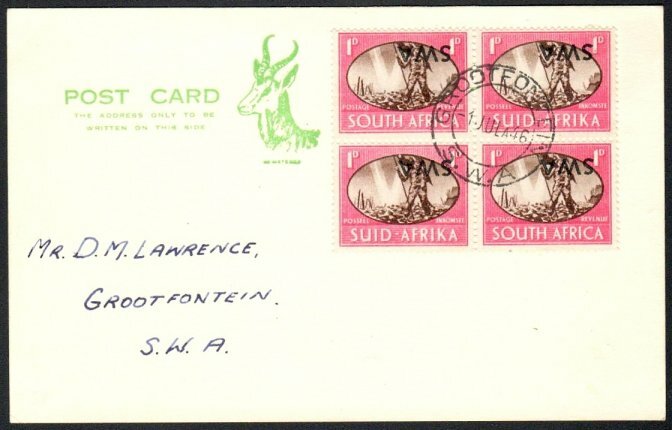 In 1884 a number of trekkers wished to return to South Africa, but when reaching Grootfontein settled there. Four years later they returned to Angola. 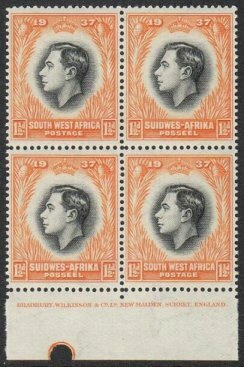 The first group of the Dorsland Trek set out on 27 May 1874 under the leadership of Gert Alberts. Different groups followed the first Trek, setting off from areas around Rustenburg, Groot Marico and Pretoria. Their primary destination was the Humpata highlands in Western Angola. 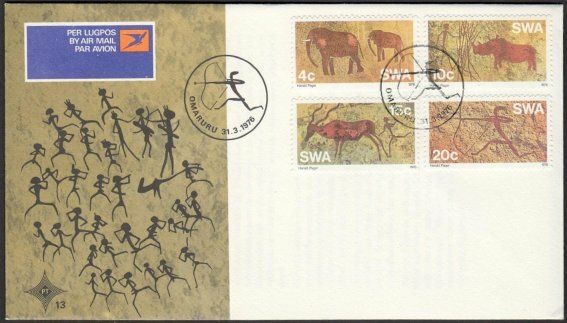 These groups had to traverse the arid Kalahari desert either via Bechuanaland or SWA. It was the harsh and dry conditions that they experienced in the Kalahari that gave the trek the name Dorsland Trek (In Afrikaans) translated Thirstland Trek. By 1905 the Boer community in Angola numbered some 2,000 but their chosen isolation brought friction with the Portuguese who pressed Catholicism on these brimstone Calvinists and insisted that their children attend government schools. 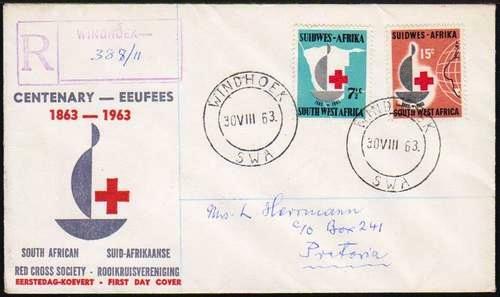 All this led to fears that their Afrikaner heritage would be lost. After 1928 nearly the entire community left Humpata with their wagons, Bibles, furniture and guns. 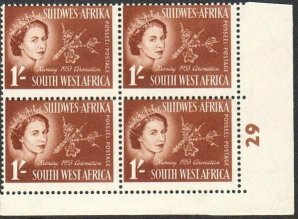 With help from the South African Government they settled in the Outjo district of South West Africa. 4c Peregrine Falcon - Because of pesticide in its food chain, numbers have fallen drastically. it preys on birds the size of pigeons. 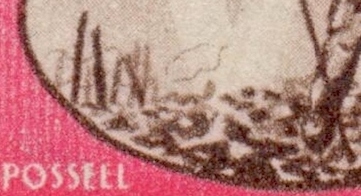 In SWA it nests on cliffs. 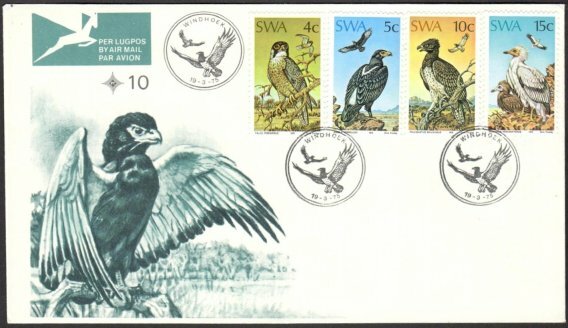 5c Black Eagle - Found in mountainous country and preys almost exclusively on rock-rabbits. Lays two eggs in a huge cliff nest, but only one chick will fledge. 10c Martial Eagle - Has a wing-span over two metres and its main prey is hares, meerkats, leguans and game birds. Many are killed by farmers as it occassionally targets sheep or goats. 15c Egyptian Vulture - Vitually extinct in Southern Africa and occassional migrants seen from the North. Supplements its carrion diet by breaking Ostrich eggs with the aid of stones. Initially an insignificant railway station between Seeheim and Lüderitzbucht. Became a hive of activity after the discovery of diamonds in 1908. 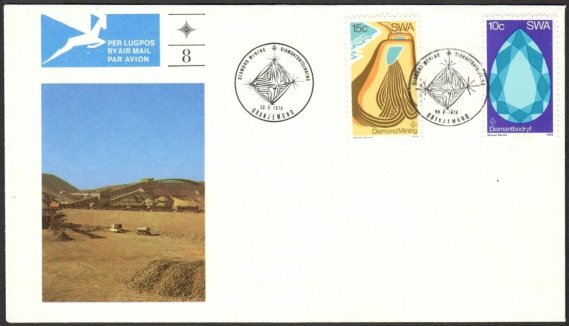 The miners built a settlement that was eventually abandoned when mining activity ceased and moved futher south. Today this ghost town is a popular tourist attraction. 'ox-transport'. Became stuck in the desert sand and abandoned. Was named Martin Luther due to his historic statement Here I stand, may God help me, I cannot do otherwise. 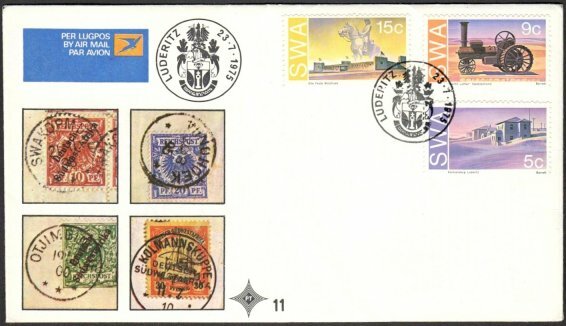 Restored in 1973 by the Swakopmund Town Council and became a National Monument. 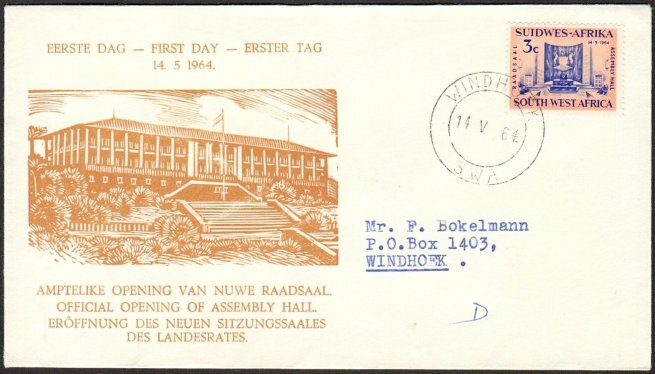 15c 'Alte Feste' (Old Fort) Windhoek Construction of the fort commenced in October 1890 under command of Captain Kurt von Francios. 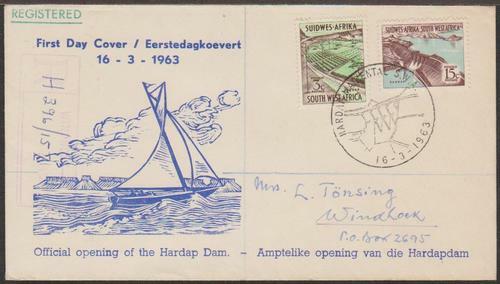 Bing a site with a strategic position plus its hot springs it marked the founding of Windhoek. In May 1915 it became HQ for SA Forces. After WWII it was a hostel & then a High School. Declared a National Monument in 1957 and its six month restoration began in 1962. 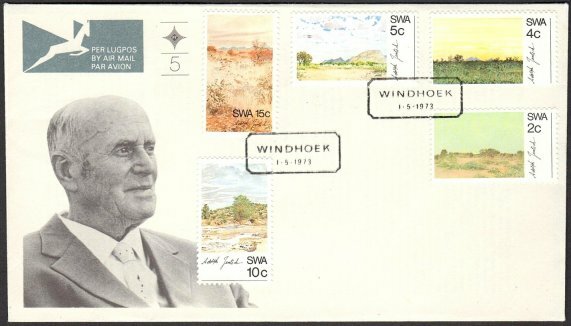 In 1947 Schröder settled in Windhoek and in 1948 established a Children's Art Centre in Windhoek. An active organizer, member of selection committees for several national art exhibitions and mainly interested in pastel-medium, portraits and landscapes. 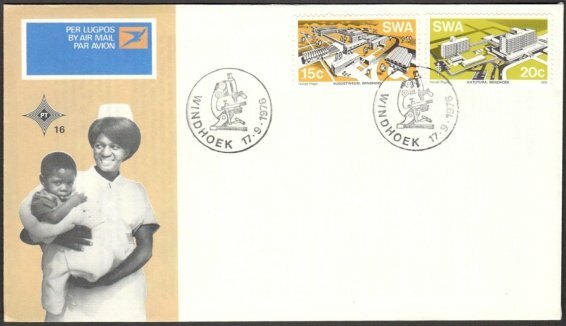 He participated in numerous South African and SWA art exhibitions and completed murals in several SWA buildings. In 1958 Schröder wrote introductory essay for small monograph on Adolph Jentsch. 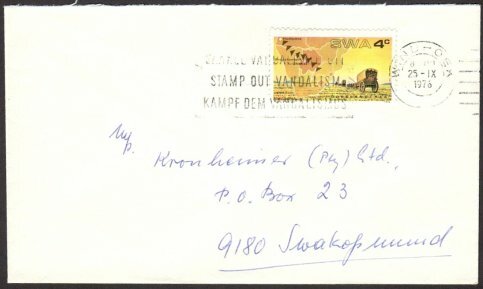 In 1962 Schröder was appointed to new chair of Fine Arts at Stellenbosch University and a committee member of SA Akademy. 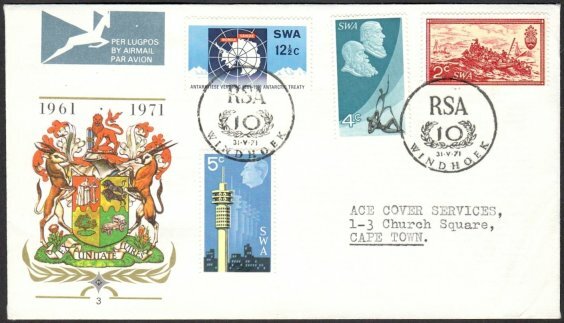 During 1967/8, a committee member of Design Institute Pretoria-Cape Town and Fellow of Royal Society of Arts. 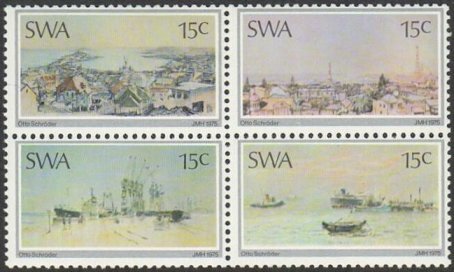 His usual subject matter was the bleak, wind-swept and melancholy desert coast of SWA, especially the towns of Luderitz and Swakopmund. 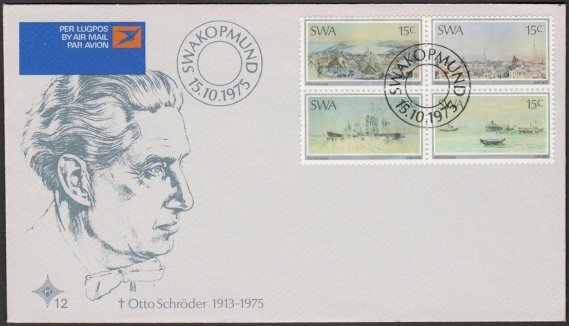 Otto Schröder died at Stellenbosch on 13 June 1975. 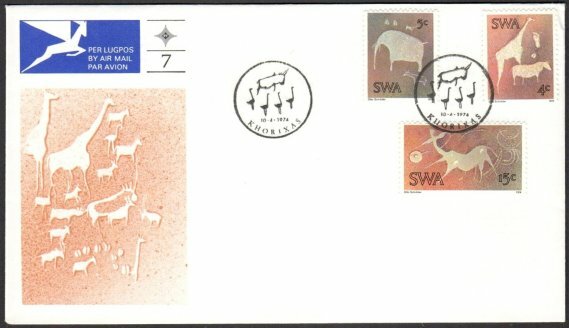 The stamps were designed by Harald Pager, the Johannesburg author of two books on South African rock paintings. 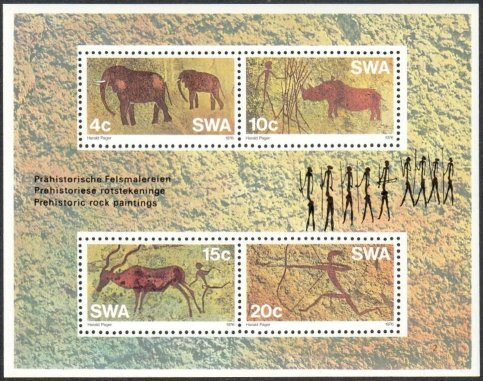 South-West Africa is extremely rich in rock art, paintings being more common than engravings. These rock paintings were executed In open rock shelters or on boulders. Radio-carbon tests have shown that the oldest South-West African rock paintings are 27,000 to 29,000 years old. They are therefore the oldest works at art in Africa. Earth colours - red in particular - were the most popular pigments while white, black and yellow were also used but never green or blue Chemical tests indicate that blood or blood serum was used as a binding agent. Human figures are the most frequently encountered motifs and they are portrayed in a multitude of postures and activities, the men often pictured with their bows and arrows whereas the women are seen gathering vegetable food with digging sticks and bags There are many beautiful paintings of game in a variety at styles Imaginary creatures, ghosts, abstracts, symbols and a few plants are also depicted and handprints occur in some of the sites The most famous of all South-West African rock paintings is the 'White Lady of the Brandberg', which is illustrated on the FDC inset card. The reason for the creation of this art is still largely a matter of conjecture but it may have had magico-religious origins connected with initiation rites, the placating of spirits and rituals to ensure rain, fertility and, perhaps most likely of all, success in the hunt. 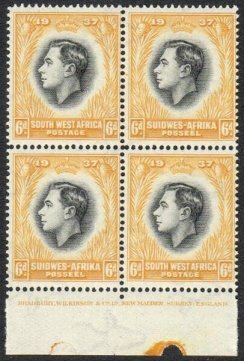 Castles in South West Africa The three castles featured on the new series of stamps of South-West Africa were designed by a German, Willi Sander, the first architect in South-West Africa. 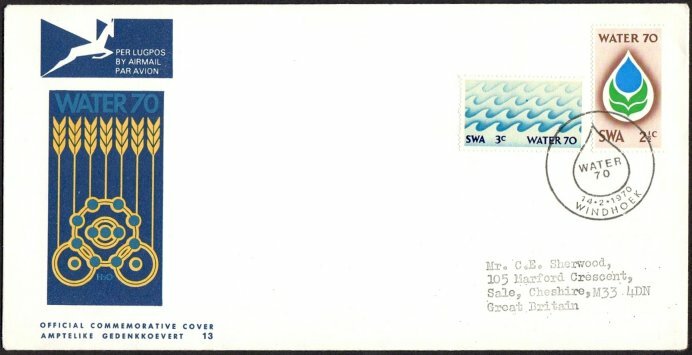 Tradition has it that he was so taken up with his romantic creations that in later years he built his own castle, the Sanderberg, which is depicted on the commemorative envelope. 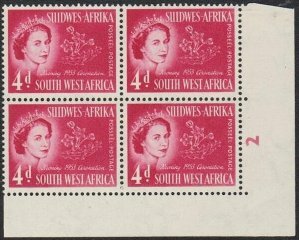 Two of these residential fortresses, Schwerinsburg and Heynitzburg which were designed for German nobility, jut from the rocky ridge above the capital city, Windhoek. The third, Schloss Duwisib, stands on the edge of the Namib desert. When Count von Schwerin married Fraulein Von Heynitz, a second castle was built at the site of a good spring, just below the first one. 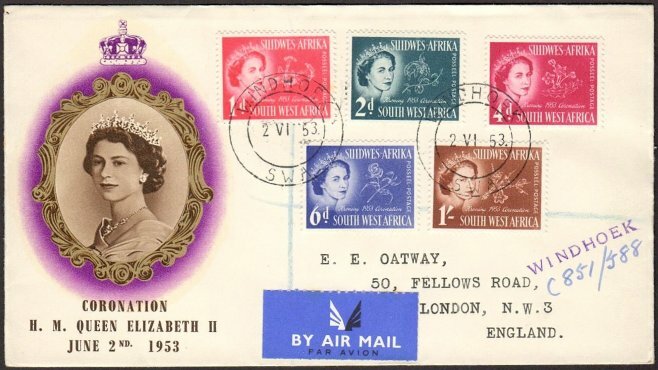 It was named Heynitzburg after Fraulein Von Heynitz. 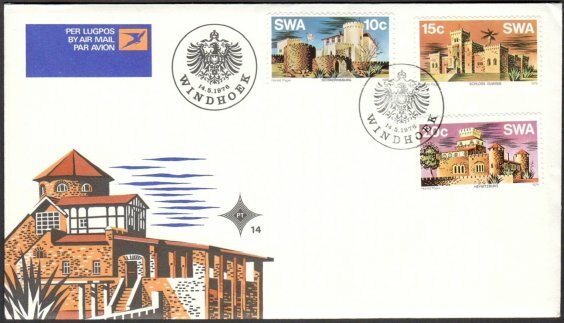 Schloss Duwisib was erected by the Baltic Baron Von Wolff, an officer of the German forces and he planned his castle to be the furthest advanced bastion of civilization. This castle is a magnificent structure with five massive square towers and an interior that has the nostalgic charm of a long-past era. 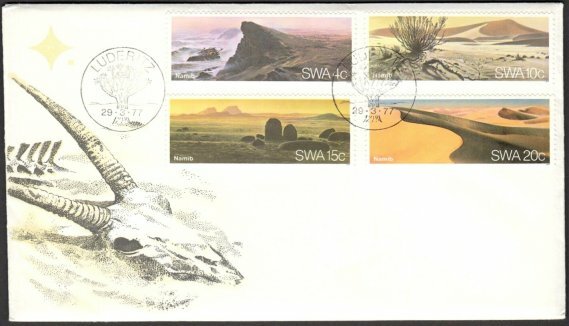 The three special stamps, commemorative envelope, stiffener card and special canceller were designed by the Johannesburg artist Harald Pager He made a special trip to South-West Africa to execute the assignment on the spot. Many obstacles had to be overcome. From a plan drawing he had to measure the foundations in order to reconstruct the walls, hidden behind trees and shrubs. 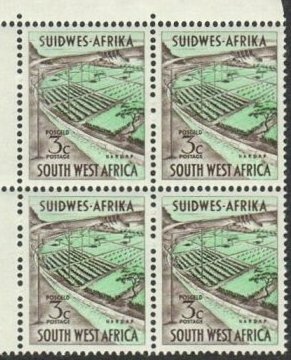 In the final art work he was obliged to omit much of the vegetation so that the stamps would not look like pictures from a botanical garden. These rock-dassies are only found north of the Brandberg in Damaraland and Kaokoland. They live mainly in very rocky places and form social colonies of up to 100 individuals. The colonies consist of family groups with one male, various females and their young. Although they are mainly active during the day, they also come out on nights when the moon is full. The old males are usually on guard. They are not very dependent on water and are exclusively herbivorous (grass, leaves and fruit). 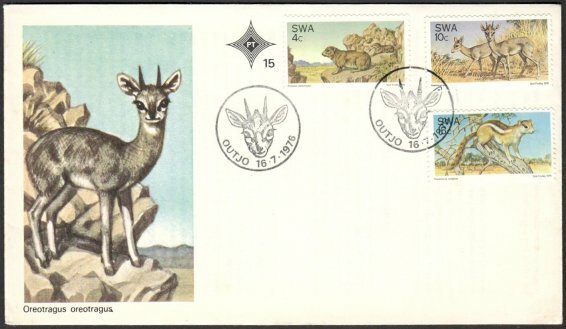 The blue duiker belongs to the dik-dik-family and is the smallest buck in South-West Africa. It has an elongated nose, which slightly resembles a trunk, and a tuft of long hair on its forehead. Only the ram has horns. The hind legs are longer than the forelegs but are bent so that the animal's back slopes to the rear. Blue duikers are found in pairs and are sometimes accompanied by the previous year’s lamb. These buck live in dry, dense bushveld and can do without water for long periods. They have common dunghills, which become quite large in course of time. Blue duikers are mainly leaf-eaters and prefer the leaves of Acacia trees. The tree-squirrel is a smallish rodent with a characteristic S-shaped tail. Tree-squirrels live singly or in pairs in trees and only descend now and then to look for food. They are pre-eminently day animals who sleep in hollow tree-trunks at night. Their food mainly consists of fruit and nuts, leaves and shoots, birds eggs, young birds, lizards and insects. The Augustineum Training Institution hasa long and interesting history dating from 1866, and for many years it was the only centre where Herero, Damara and Nama teachers could be trained. Like many other institutions of its kind it came into existence through missionary endeavour. For almost half a century it operated under humble though fascinating circumstances at Okahandja and in 1968 it was moved to Windhoek where it now caters for all the ingenous races in SWA. The Augustineum functions under the Department of Bantu Education. The present college with extensions was built at a cost of R2.8 million. The buildings include a hostel for 700 students, a high school catering for 500 pupils, a teachers training centre for 150 students, a technical and trade centre for 150 pupils and a modern hall that can accommodate an audience of 1,000 and also serves as a gymnasium. The equipment in the school is modern and adequate. There are science laboratories, a domestic science centre, a typing room, a science lecture room and a well-appointed library. Sporting activities are catered for on a large scale and the necessary sports fields have been constructed on the campus. The students are proud of their institution's history and traditions extending over more than a hundred years. They regard it as an accepted centre of educational and technical training and they are facing the future with confidence, secure in the belief that advancement both in the quality and scope of the tuition offered can only improve in the years ahead. This is the name of the modern state hospital in Windhoek where all Non-White population groups receive medical treatment. The hospital, with its intensive-care unit, 11 theatres and 734 beds took four years to complete. Together with the necessary equipment it cost over R9 million. Psychiatric patients and consumptives are treated in an adjacent building housing 448 beds. An average of 570 in- and 260 out-patients are treated daily by 45 medical practitioners, 365 nursing staff members and 162 other administrative staff members. The annual operating costs amount to approximately R4 million. 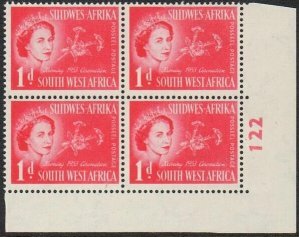 South-West Africa comprises an area of 82,429 600 ha and its topographical and climatic regions are as varied as the appearance and customs of the peoples inhabiting them. It is a country with an abundant mineral wealth that is as yet largely unexploited. The mining of minerals requires a large supply of electric power and water. Coal is one of the few minerals that has not been found in economically viable deposits in South-West Africa and alternative sources of power had therefore to be considered. The greater part of the territory has a low rainfall and consequently there are no perennial rivers. Natural perennial sources are extremely rare. 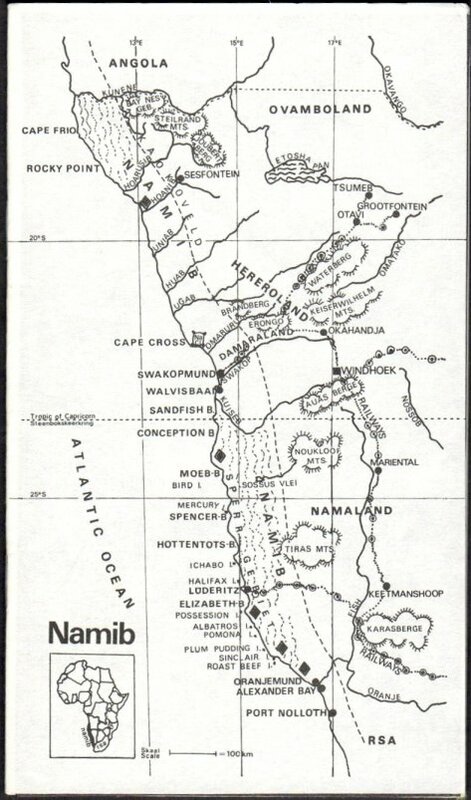 During the previous century, the Ovambo nation settled in Central Ovambo because of the flood-water that accumulated in the numerous depressions. The population grew and an additional water supply has had to be provided for their support. Initially, the Oshakati and Eta canals were built to collect the surplus floodwater from the sparsely populated outlying areas and convey it to the densely populated central areas. Without this water, the area would be drought-stricken for at least five out of every ten years. The Kunene River in the north has an annual flow of 5,000,000,000 cubic metres and is already being developed and utilized as a source of water and hydro-electric power for the benefit of the area. The water is conveyed along canals and is pumped over long distances. The canal that will carry water to Ovambo and later further south has progressed well. The utilization of the water is a great challenge, but will eventually bring relief to man, animals and plants over a vast area. The hydro-electric power scheme at the Ruacana Falls needs much more extensive planning and construction. The first hydroelectric power station will only be commissioned several years hence. In the meantime, a great deal has already been accomplished towards supplying this developing area with sufficient power. 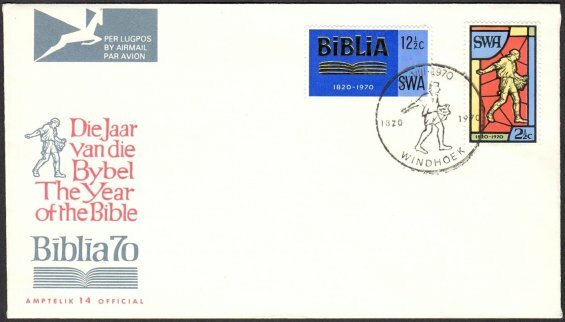 The First Day Cover for this issue includes a booklet with the adjoining map on the front. 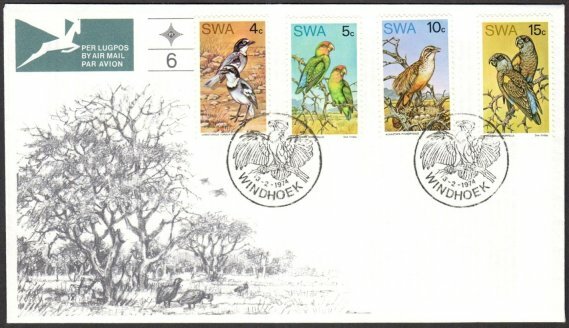 There is a seven page write up on the Namib in Afikaans, English and German by Herman Steyn, the head of Philatelic Services for many years. The size of the print in the booklet is small and is tiresome to read. Herman had command of all three languages and I believe his English version is more than likely a translation as it is heavy going, does not flow and burden’s the brain. I OCR-ed the text which almost fills four A4 pages. The gist of the write up describes the area from North to South and from West to East. The numerous rivers, that are in the main dry river beds, except during periods of rare rainfall. The unrelenting climate, plants, insects and animals which survive in this arid area. Parts of the coast abound with birds and seal colonies and the former is a good source for the guano industry. The cold sea current is rich with fish life and provides a good seasonal harvest from the sea that includes a crayfish industry. 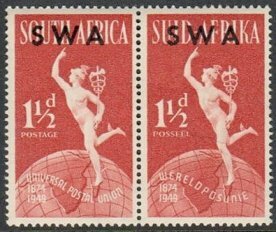 Part of the history of SWA is touched and an account of the 1908 diamond rush in the region of Kolmannskop. The foregoing includes tales of wealthy diamond prospectors whose women bathed in champagne!